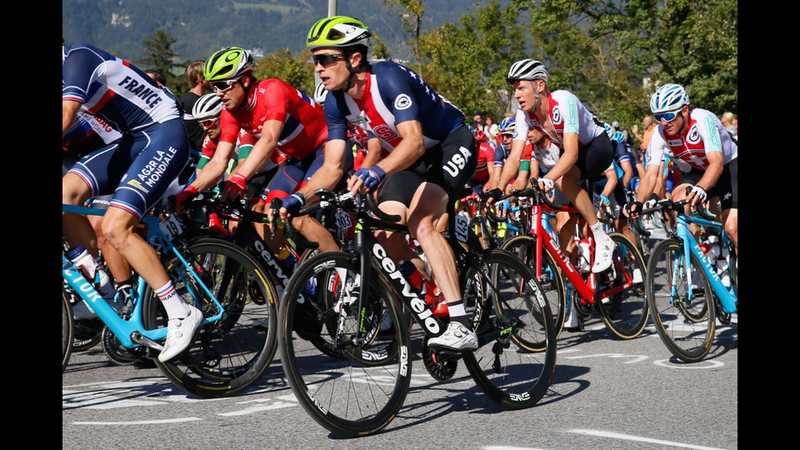 The first stage win at the Vuelta qualified me to represent the USA in the World Championships in Innsbruck, Austria exactly two weeks after the Vuelta. This honour filled me with pride. I continued training, riding out for an hour or so, doing some efforts and turning around when I didn’t feel good. I knew that if I was patient and continued riding without overdoing it form would show up. After 10 days I started coming back to life and flew to meet the USA national team in Austria. A forest fire near Pisa cancelled my first flight so the trip was a near miss, but after a “casino” I managed to make a flight out of Genova, Italy. Brent Bookwalter, Peter Stetina, Sepp Kuss and I made up the four spots we had qualified. I savored cruising the stunning terrain in the Tirol region deep in conversation with my compatriots. A 4.5 hour recon ride revealed the nine backbreaking climbs we would face after a rolling departure that led to seven laps of a technical circuit. We shared a bus with the Canadian team and it felt funny parking beside the South Africans using our Team Dimension Data bus. Cold morning air prompted lengthy wardrobe discussions, but we heated up when the race kicked off. I considered going in a breakaway of more than 10 riders. After a 30 minute scuffle 11 riders escaped. Wishing I had made it, I went back to the team car to explain (we didn’t have radios). Our Director, Nate Wilson, said “You’re doing great, man. You’re going to have a great day. I’m really proud of you!” I rode back to the peloton befuddled by his response and inspired by his optimism and belief. “Yeah! I can have a great day!" As the breakaway’s advantage stretched over 18 minutes, the peloton meandered along. I enjoyed chatting with friends, but began to feel anxious about the gap to the break until a team took control. From the time the chase began in earnest on the first climb, we never slowed down. Halfway through the race, groups of riders began to drop. During a very brief lull with four laps to go, I looked for an opportunity to attack, but the Spanish team took over and lifted the pace even higher. I began hurting but saw other great climbers suffering. As we crested the climb and began descending with three laps to go the rider in front of me lost traction and crashed. I braked hard but saw no way out. My front wheel plowed into him and I launched into the asphalt. Nothing broke on me or my bike, so I set off in pursuit. On the next climb a few stragglers and I caught the peloton. Breathing out of my ears and on the limit, I fought to stay. When I saw an Italian attack the group less than 3 km from the top, I waited for the acceleration to yank the back of the group. I had no energy to respond and lost contact. With 6 hours of suffering invested, I was determined to finish inside the time cut. The organisers saved the best for last. On the final lap, the course veered off the circuit to include the Höll climb or “Hell Climb” which dragged up at 28%. At the bottom disabling cramps gripped my adductors and hamstrings especially where the crash had impacted them. With such a steep climb ahead, I climbed off my bike and punched my legs to tenderise the knotted muscle. The Hell Climb lived up to it’s name, but I made it to the line. Just 76 of the 188 riders finished. Jenna met me at the finish with our friends from Lucca who had come to cheer. Brent Bookwalter had finished in a group just ahead of me. My former Canadian teammate Mike Woods placed 3rd behind the new world champ, Alejandro Valverde. Results wise, it wasn’t the “great day” we believed was possible, but I’m proud of this effort to close out my 2018 season and already excited for 2019. Thanks for your encouragement and support this year.